Over the years, Russia developed a plasma thruster based on the Hall effect, and implemented it on more than 100 satellites. This device has now become available worldwide, and is simple and practical. The Hall thruster belongs to the family of magnetoplasmadynamic devices, and has been shown to share the practical properties of the low-pressure arc-jet described above—and it works. However, it was only in the Russian space programme that it had been brought to a practical and space-qualified form. In an ionised gas the Hall effect, as it applies to thrusters, can be understood in the following simple way, developing from the situation shown in Figure 6.14 but taking into account the collisions between the electrons, ions, and neutral gas molecules. In free space with the crossed fields (shown in Figure 6.14) the electrons and ions follow spiral tracks with diameters dependent on their charge-to-mass ratio; electrons move in tight spirals, and ions move in wider spirals. The net current in the axial direction is zero, because the electrons and ions move in the same direction. It is, in fact, this motion which generates the plasma flow shown in the figure. If we now consider that this spiral motion will be interrupted every time an ion or electron collides with a gas molecule, we can see that if these collisions are very frequent then very little motion along the channel can occur, and the predominant drift will be along the E vector. If the collisions are infrequent, then the spiral motion continues uninterrupted, and the predominant drift is along the axis of the channel. The parameter which determines whether collisions are frequent or infrequent is the Hall parameter—the ratio of the gyro frequency of the particle in the magnetic field to the particle collision frequency. For large values of this ratio, axial drift occurs because collisions are infrequent; for small values, collisions dominate and the flow is along the electric field. If electrons and ions are affected equally, there will be no net current in the axial direction, and a neutral plasma flow will arise. In fact, because of the large difference in electron and ion charge-to-mass ratio, electrons and ions behave very differently. With their small gyro radius, electrons can, under certain density conditions, drift freely in the axial direction, while the ions, undergoing many more collisions per cycle, are constrained to drift along the electric field. This generates a net axial electron current called the Hall current. This current, and the fields it sets up, can be used to accelerate the plasma in a Hall thruster. There are two possible configurations, the simplest of which is shown in Figure 6.15. Note that in this figure the electric field is axial, unlike the situation depicted in Figure 6.14, and so the Hall current is transverse. Here there is an axial electric field and a transverse magnetic field. If the gyro-frequency of the electrons is sufficiently large, their Hall parameter is significantly greater than unity and they drift in a direction orthogonal to both fields (upwards in the diagram) as the Hall current j. This current again interacts with the magnetic field to produce an axial force, which accelerates the plasma. These effects are described as acting sequentially, although in reality all act together as an internally self-consistent system of forces and fields; the result is a high-velocity exhaust stream. This configuration easily adapts to a coaxial geometry, and it is in this form that the Russian Hall thruster has been successful. The coaxial form has a major advantage, because the Hall current can form a closed loop and the electrons never interact with the walls. Figure 6.15. 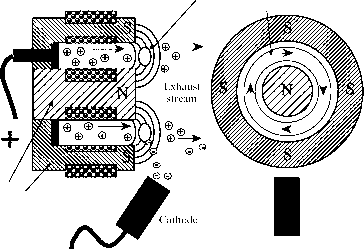 Principle of the Hall effect thruster. Figure 6.16. Schematic of the Hall thruster. The general scheme is illustrated in Figure 6.16. The principle is exactly the same as illustrated in Figure 6.15, except for the coaxial geometry. The iron poles, energised by field windings, generate a cylindrically symmetric magnetic field of a few hundred Gauss, which is radial across the annular discharge cell. This cell is fully lined with insulating material—usually alumina or boron nitride. 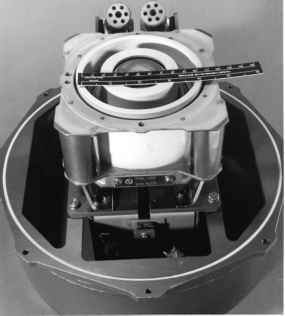 The propellant is introduced through fine holes distributed uniformly around the base of the cell, and is partially ionised by the discharge, which is developed between the annular anode and the cathode electron gun. The Hall effect ensures that the electrons acted on by the crossed electric and magnetic fields set up a circular Hall current at the exit of the cell. The interaction of the Hall current and the radial magnetic field generates an outward force which is transmitted to the ions and neutral gas atoms by collision, and this generates the exhaust stream. The magnetoplasmadynamics is complicated, and it is in some ways simpler to think of this device as an electrostatic accelerator in which the outer grid is replaced by the electrons circulating in the Hall current. Ions can be thought of as being accelerated by the electric field developed between the Hall current ring (negatively charged) and the anode annulus at the base of the cell. It has the inestimable advantage over the ion drive of there being no space charge limitation, and partial ionisation is acceptable; in fact the exhaust stream is more or less neutral. Much higher thrust is thus possible. The Hall thruster is a practical device, and the theory is complex and by no means secure, so an example will be more illuminating than an attempt to calculate the performance. By analogy with the electrostatic engine, the overall efficiency will increase with exhaust velocity, and the exhaust velocity itself will increase with the applied potential difference between anode and cathode. The Russian SPT 140 5kW thruster—a large Hall thruster—develops an exhaust velocity of 22.5 km/s for a discharge potential of 450 Y, and a thrust of 250mN. The discharge current is 10 A, and the efficiency is 57%. The thrust-to-power ratio is close to the theoretical value for electrostatic acceleration given in Figure 6.12. However, the thrust per unit area is much larger than for the electrostatic engine—about a factor of 10 (Figure 6.10). This is a direct consequence of the space charge limitation of the electrostatic engine, which limits the current flow. The exhaust velocity is typical for this kind of thruster: 15-25 km/s is the normal range, compared with the electrostatic thruster, which is really optimum in the 50-100 km/s range. It is clear that the development of Hall thrusters and other types of plasma device is in a very active phase, stimulated by the input from Russia. Improved systems are continuing to emerge, and will find ready application in station keeping and interorbit transfer.